Homeowners in Rockleigh, New Jersey, occasionally encounter water problems that can be traced to the sewer main line. Organic materials, foreign objects, or invasive tree roots can often cause clogging or blockage inside of your sewer main, obstructing the flow of water and causing sewage to back up into your household plumbing system. Common signs of a sewer clog include foul smells, multiple clogged fixtures, and gurgling noises from inside your drains. One of the most common and effective methods for sewer cleaning is to use high-powered hydraulic jets to clear out blockage and debris. Sewer jetting is a safe, effective, noninvasive method for clearing out clogs and other problems lurking in your sewer main line. A blocked sewer line will only grow worse over time, potentially leading to a nasty sewer backup problem that could cause sewage to flow back into your pipes and plumbing fixtures, so it’s best to call a professional as soon as possible to fix the problem. If you’re in need of professional sewer cleaning in Rockleigh, call us today at A1 Sewer jetting in NJ. Hydrojetting uses streams of water at high pressures, similar to a pressure washer, for sewer cleaning purposes. Sewer jetting equipment is provided to professionals by manufacturers like Ridgid, REMS, and Grainger. 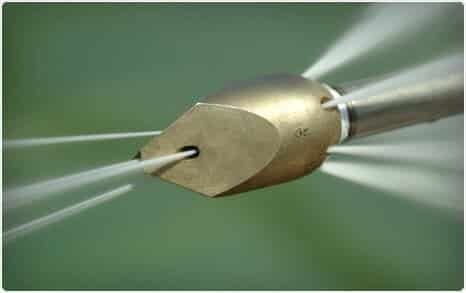 The sewer hydrojetting apparatus includes specialized pumps and hoses that allow water to reach the high pressures that are needed, creating an incredibly powerful stream of water that can clear out even the most stubborn materials from sewer main line pipes. Clearing out grease. Any type of material that could be described as “greasy” can be a serious cause of plumbing blockages. Most homeowners are familiar with the effects of cooking grease on your kitchen drain, and the situation with sewers is similar. Hydraulic jets for sewer cleaning can pulverize grease into an emulsion of small droplets, safely clearing it away. Destroying tree roots. The root systems of large trees are prone to growing into and around sewer pipes, causing damage and clogging. Hydraulic jetting can be set to sufficiently high pressures to cut through roots like a saw, pulverizing them into manageable pieces so that the can be washed away. Breaking up sludge. The high-pressure water streams can break apart accumulated organic sludge that builds up inside of sewer main lines, dissolving it and clearing it away to eliminate blockage and restore normal water flow. Hydrojetting can clear out years’ worth of built-up sludge, slime, and debris, clearing the way for water and sewage to flow smoothly through the sewer main and away from your home. If you suspect your sewer main line might be clogged, don’t wait too long to deal with the problem. For fast, effective sewer cleaning in New Jersey , give us a call at A1 Sewer Cleaning, at 201-645-0888.